THE JAZZ RANGE. EXTRA LIGHT GAUGE. 11-50. CHROME TAPE FLATS. BALL-ENDS. 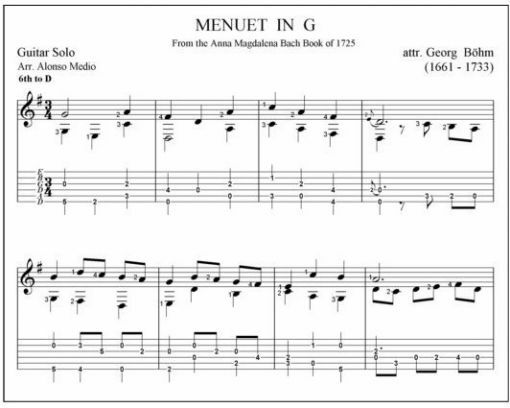 MENUET IN G FROM THE ANNA MAGDALENA BACH BOOK OF 1725. 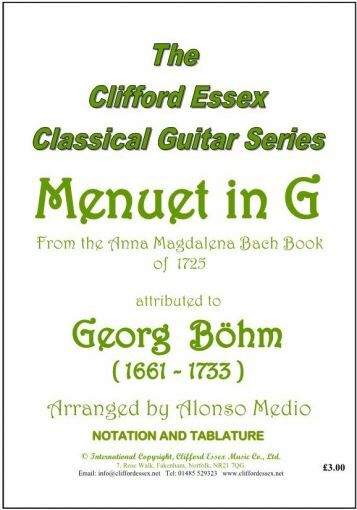 Location: /Sheet music/Guitar Series/MENUET IN G FROM THE ANNA MAGDALENA BACH BOOK OF 1725. This is another of the easy keyboard pieces collected by J.S. Bach for his second wife. Although experts are not positive, it seems likely that the title in Bach’s book: ‘Menuet fait par Mons. Böhm’ refers to this Georg Böhm, an old friend. On the keyboard, this piece would be played as a fast one-in-a-bar minuet, with a metronome speed of a dotted minim equal to about 60, but the average guitarist will find it advisable to employ a more sedate pace, — at least until it has been thoroughly mastered. BMG - The fretted instrument magazine.